The author K.L Loveley’s reviews the latest bestselling novels. 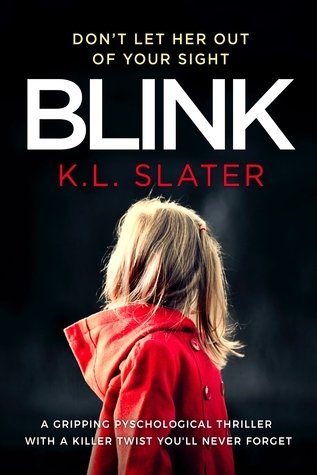 Having read ‘ Safe with me’ I immediately purchased Blink and Liar ( on pre-order) I am now hooked on K.L Slater as an author of psychological fiction. Blink is a fast paced thriller with believable characters and a twist around every corner. I was very close to the ending before I had worked out the lot. K.L Slater tricks the reader into assuming the perpetrator of the crime is a character that she has involved extensively in the victim’s life. However, the ending is most unexpected and actually quite shocking. Well done to K.L Slater on a remarkable and well-written book. If you think the normal school run on a Monday is entertaining you should try doing it from a tent in your back garden surrounded by the jumbled up contents of your entire home. It is vastly more diverting. Our heroine has survived the sudden collapse of her home – or has she? Certain events two and a half years ago led her to deliberately destroy an important piece of herself, hiding away all remaining evidence that it ever existed. What happens when she decides to go looking for it? Does she really deserve to be whole again? Inspired by a true story, this is an account of one woman’s secret guilt and her journey in search of forgiveness! Accidental Damage by Alice May, is refreshingly written in the first-person narrative, thereby allowing the reader, the advantage of getting into the heart and mind of the protagonist. She takes us with her on a journey, charting the unfortunate ‘accidental damage’ to the family home and the subsequent and consistent barriers that were deliberately put in their path by the insurance company dealing with their claim. I read with interest, how the main protagonist and narrator suffered psychologically as a result of the damage to the family home to the point of spiralling down into a path of self-destruction which was dragging her down, making it difficult for her to move forward. Despite this, she forges on for the sake of her husband and children. The writing is unfussy, clear and with an undertone of dry wit and humour. Alice May draws the reader into the family to become a bystander on the side-lines watching the story unfold. The definitions at the beginning of each chapter are unique and informative, adding to the charm of this well-written book. Although the lack of character names and the use of affectionate names such as beloved husband, Chaos, Logic, Quiet and Small add to the comic understatement of the story. I felt that at times this diluted their characters a little and yet at the same time added to the light-hearted manner in which this delightful book has been written. I thoroughly enjoyed reading Accidental Damage and look forward to a sequel. Alice May is a multi-tasking mother with four not-so-small children and she is fortunate enough to be married to (probably) the most patient man on the planet. They live in, what used to be, a ramshackle old cottage in the country. Her conservatory is always festooned with wet washing and her kitchen full of cake. Following many years exhibiting as a mixed media artist, Alice decided that 2016 was the year she would write her first fictional novel. ‘Accidental Damage – Tales from the house that sat down’ simply wouldn’t leave her alone until it was written. Accidental Damage by Alice May is available to purchase at Amazon. I recently read The Dennis Bisskit Adventures written by Stephen Ainley and published by Austin Macauley. I truly enjoyed this delightful, well-written book. The character of Dennis came alive to me, from boy to man and had me chuckling from the beginning to the end. Stephen Ainley has developed a range of believable characters and a storyline that encouraged me to continue reading. I could not put this down. Stinky Blackshaw reminded me of a comic book character along with the other young wolf cubs. I particularly enjoyed the poignant way that Stephen Ainley weaved in the story of Granddad and his journey to say farewell to his old comrade Persy Dorsey, from the Royal Warwickshire Regiment. This is a highly amusing, intelligent and heart warming read which I highly recommend. Stephen Ainley was born in Birmingham U.K. in 1952. He served in the British Airborne in the 1970s before emigrating to Australia. He has written short stories and articles for many years but this is his first novel. He resides in Western Australia with wife Jane and Irish terrier O’Malley. The book is available to purchase at Amazon and all other leading bookstores. How does an intelligent, sunny-natured nurse, with a husband she loves and a wonderful daughter find her life spiralling out of control and into the gutter? What does it take to push a well-balanced woman over the edge and into the grips of alcoholism? K. L Loveley’s exciting debut novel Alice explores these thorny questions. Using her own medical background as a nurse to inform Alice’s descent into addiction, the author cleverly combines a fast-moving plot with an acutely observed account of a life in flux and peril. Alice’s husband loves her but fails to stand up to his grown-up children. Initially tolerating his weakness, Alice is finally spurred into action when her own daughter needs her help. Pushed beyond endurance, Alice moves out of her home. Loveley reveals how easy it is, when faced with domestic problems, to lose one’s perspective, dignity and health. Without the kindness of a stranger who understands what Alice is going through, this gritty domestic drama could have had a far darker ending. As it is, the conclusion brings hope. Alice is a racy, compelling read. I picked up the book and didn’t put it down till I’d read the last word. Pippa Kelly writes extensively in the national press about dementia, with which her mother lived for over a decade. She blogs for the Huffington Post and mariashriver.com, and has her own award-winning website, pippakelly.co.uk. She lives in Wandsworth with her husband and dog, Bert. Amazon , Waterstones and other leading book stores! I absolutely loved reading ‘Invisible Ink’ written by Pippa Kelly. I was hooked from the first chapter when the main protagonist of the story was still a young boy. Throughout the story she frequently refers back to the introduction of Maxi as a small boy when he is looking through his mum’s childhood encyclopaedia and the way he examines the words, breaking them down into syllables. Pippa Kelly allows the reader to get inside the heart and mind of Maxi as a child and as a man, by cleverly juxtaposing the story in a beautiful and sensitive way. The story gradually unfolds through two narratives. Throughout the story, she never fails to deliver the imagery required to feed the readers imagination. I could almost see Maxi and Peter playing together on the trapeze and climbing into their hiding places. As the sibling rivalry and jealousy gains momentum with the risk of running out of control, the reader is kept guessing if just maybe, Maxi does have some link with the disappearance of his brother Peter. This is reinforced by the way Pippa Kelly describes in detail the psychological impact of the family tragedy and how the long term consequences of this, follow Maxi into his adult life. The subject of dementia is woven into this story, without impacting on the main theme, which is the story of a missing child. As Maxi becomes more aware that his mother is slipping further and further into the realms of dementia, he also is heading towards a potential breakdown. He is haunted by the tragedy of his missing brother and his assumed avoidance of the responsibility he has for his mother. While trying to suppress his past, he puts his present situation as a London based Lawyer, and a new father, at risk. This is a very emotional read. I felt the pain of bereavement in the true sense of the word and also in terms of a pseudo bereavement linked to the process of dementia. London lawyer Max Rivers has it all – a burgeoning career, a beautiful girlfriend, an exclusive address – but he harbours a long-buried secret that threatens to destroy his carefully constructed world. Invisible Ink is a mesmerising novel of guilt, loss and betrayal within a family – of sibling jealousy that threatens to run out of control, a mother’s life all-but forgotten through the fog of dementia and a son who longs to, but cannot, escape his past. Pippa Kelly’s haunting debut offers a deft exploration of the complex emotions hidden beneath the surface of our lives; drawing its readers into Max’s story and leading them, step by careful step, towards its inevitable dénouement. ‘Invisible Ink’ by Pippa Kelly is published by Austin Macauley and is available from all good bookshops. Jane Green has written with great insight about a sensitive subject and weaved it in such a way that she exposes the genetic origins of Catherine’s disposition to her addictive behaviour. I like the way that she leads us into thinking quite early in the story, that just maybe her father is not her biological father as they are such polar opposites. Jane Green portrays Catherine’s journey through every cycle of her addiction, while describing the consequences of her actions. My debut novel ‘Alice’ shares a few similarities to ‘Summer Secrets’ by the author Jane Green. The protagonist of my novel becomes an alcoholic. ‘Alice‘ is at times, a gritty but realistic story of a woman who finds herself in desperate straits. The story tackles alcoholism head-on, and presents the reader with an empathetic account of a spiralling addiction and the resulting pattern of hopelessness that many fall into. My novel follows the protagonist Alice, mother of two and step mother to four, from when life’s problems first begin to scratch away at her self-esteem and follow her in her gradual, but steady, decline. ‘Alice‘ addresses the seriousness of addiction and shows us the importance of love and support for an addict with astounding accuracy. I loved the setting of this story, Dinah Jefferies brings to life, the sights and sounds of Ceylon in the 1920’s. Her rich descriptions transported me to this beautiful country. The characters are very much of their time and place. The story gradually unfolds to reveal an interesting twist which kept me guessing until the author in a timely manner revealed the family history. I look forward to reading further novels by Dinah Jefferies. This book review is also featured on my ‘Good Reads’ profile, along with additional books that I have been reviewing, many by bestselling authors. On Good Reads you can also list my debut novel ‘Alice’ as ‘To Read’. John le Carré ‘s ‘A Delicate Truth’ intrigued and transported me into the world of counter terrorism and all that it entails. The plot constantly kept me guessing about a potential conspiracy and what the outcome might be for the British Foreign Office. A Delicate truth wet my appetite to read further books written by John le Carre. On GoodReads I rated ‘A Delicate Truth’ 4 stars. Have you read the book, what do you think about it? If you haven’t yet read it, you can purchase at Amazon , and other book stores.